I have been using KWFinder for awhile now, and a new keyword I've been looking at I noticed something strange. It shows data from March - June. But stops at June. Does that mean there is no searches from July - October. Or have they not collected that data yet? I believe they haven't gotten that data yet (I don't see a keyword going from 5k to nothing in a month) but if that is the case, then its been 3 months of no update from KWFinder. So is it a dead keyword now, or just slow updates? 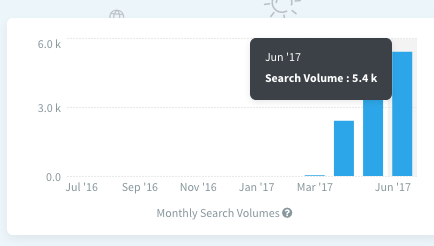 If it is just slow updates, does anyone have any other keyword volume tool suggestions for me? Why don't you use Google Keywords Tool? Just deposit $1 in Google AdWords and you can use Google Keywords Tool. I don't know if that still works, but there must be a way you could use that. You can try to check the search volume in kwfinder as well. Also, is it a seasonal KW? (2017-11-01, 08:58 AM)xxsaumitraxx Wrote: Why don't you use Google Keywords Tool? Just deposit $1 in Google AdWords and you can use Google Keywords Tool. I don't know if that still works, but there must be a way you could use that. You can try to check the search volume in kwfinder as well. Also, is it a seasonal KW? I wasn't aware that just depositing $1 let me see the exact keyword volume, versus the new range. Anyone to confirm that? Might try that or look into that. And it is not a seasonal keyword. I would suggest reverifying the keyword on google keyword planner. KWfinder do give accurate data report. How do you sign up for it? I looked it up but all I could do was enter in a website for an advertisement, is that what you're referring to? Update! I spent $6.10 on google adwords for an unrelated campaign I now have more detailed stats! Thank you xxsaumitraxx your answer worked! (2017-11-05, 07:34 AM)illusionist Wrote: Update! I spent $6.10 on google adwords for an unrelated campaign I now have more detailed stats! Glad to be of help, sir. Don't worry about missing on this KW, at least you have everything ready now and in the future you won't miss on any opportunities.